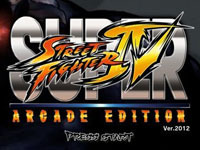 The long awaited version 2012 of Super Street Fighter IV Arcade Edition is released today. Capcom listened opinions expressed by players during location tests to rebalance the characters. Demand from fans was indeed huge on this! Capcom provided a lot of work to rebalance the 40 characters of SSF IV: some have seen many changes (Yun), while others have had a few (Cammy, Sagat). If you want to discover all the changes, simply download the document published by Capcom. 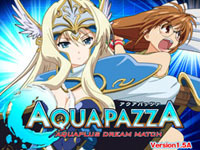 Examu releases AquaPazza - Aquaplus Dream Match Version 1.5A today. This first update of this fighting game gathering fighters from various AquaPlus works adds two new characters: Sasara Kusugawa (playable character) from ToHeart 2 and Yu Nagawa (supporting character) from Comic Party. During August, players were able to vote for different characters to choose two of them that would be added to AquaPazza line-up. Version 1.5A also fixes some bugs and make small changes in characters moves. 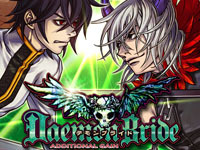 Examu releases Daemon Bride Additional Gain today, it's an update to Daemon Bride that was out on eX-Board in 2009. Daemon Bride AG, which was presented during the AM Show held last September, adds two new characters to the 16 already existing ones: Pure and her partner Zadkiel, a fallen angel. Examu also took the opportunity to make some changes to characters balance. 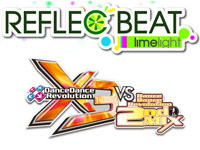 Daemon Bride Additional Gain is available on NESiCAxLive (Taito Type X²). Sega announced StarBoat release for November 24 but it is available since yesterday at the same time as another Sega betting game: Star Horse 3! There's no horses here but boats ... The principle is very similar to Star Horse: a giant screen broadcasting the race and each player has his own seat equipped with a screen. Here the player can acquire boats races, customize them (parts, colors, decorations), train and manage the careers of drivers, whom he can set the appearance as he wishes, and of course makes bets on boat races. Players with some experience will be surprised to be able to face Kenji Hatano, the main character of Monkey Turn, a racing boat themed manga by Katsutoshi Kawai. 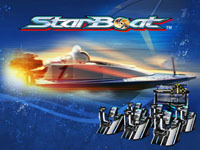 StarBoat runs on RingEdge, from 6 to 11 satellites can be connected to the giant screen, it uses ALL.Net network and it is compatible with Aime card and Bana Passport. 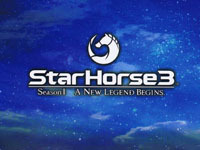 Horse racing bet/management game Star Horse 3 Season I - A new legend begins debuted today. The third episode of Sega's popular series in Japan, has a new housing even more luxurious than before: in addition to the big DLP screen, there are now five sub-movable LCD screens. LEDs, that light up on race rhythm, have been added. The new reclinable seats can now accommodate two people. Each player has a 32 "screen to display "BET game" and "Game owner" modes simultaneously. The game is highly diversified, between two bets on horse racing, players can raise and train their horses, select jockeys and train them (physically and tactically) and also play at the casino. Everything is done for the player to feel in the shoes of a real breeder: each type of training field will promote a type of horse development, the kind of food influences the horse, horses can be pastured to rest or when they retire, it is also when they are grazing that the player may attempt to breed them... Star Horse 3 is compatible with Aime card and Bana Passport. Today, Sega starts to distribute Shining Force Cross Raid VersionB. Version.A released in June added a lot of new features but this time the update seems a little less consistent. New cooperative quests for level 30 and above players are available, some of them are limited in time. 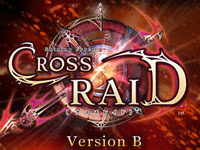 Shining Force Cross Raid Version.B adds new scenarios, corrects problems in some items' name and makes some adjustments to the gameplay. 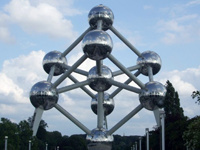 Since the closing of the Family Games Gallery 5 years ago, there was no place to have fun in Brussels any more. Things will change tomorrow with the opening of a new arcade! But beware, this time, this is not the place for a Sunday family day because versus fighting is the theme. This is not surprising when one considers that Kenpachi (representing Europe on SSF4AE and SSF2X at Tougeki 2011) is behind this initiative. There are no fewer than 7 Astro City and 4 cabinets with HD screens on which you can fight each others on Super Street Fighter IV Arcade Edition, Street Fighter III 3rd Strike, Super Street Fighter II X, The King of Fighter XIII, The King of Fighter '98, Hokuto no Ken and Garou Mark of The Wolves. The price is 50 cents for 1 or 2 credits depending on the game. The arcade is located at Rue Haubrechtsstraat No. 8 in Molenbeek-Saint-Jean/Sint-Jans-Molenbeek, just steps away from the Compte de Flandre/Graaf van Vlaanderen subway station (lines 1 and 5). The doors will open at 14:30 tomorrow. On this occasion, it will be possible for only €5 to have infinite credits for all games until 2:00! Food and beverages will be available and the famous French player/commentator Ken Bogard will attend the party. Players will therefore be of a very high level, if you are looking for a fight, you're at the right place! 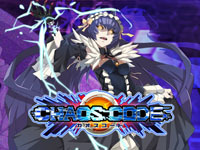 Chaos Code Version 1.01 arrives today in Japanese arcades. FK Digital fighting game's update was quite expected since it fixes the bug that prevented the game to run correctly when the player selects the character Cerberus. 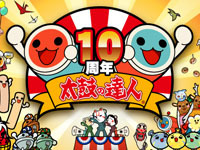 This version 1.01 fixes also other bugs and rebalances the game. A new character is added to the line-up: Celia II, a modified version of the character Celia.